Democrat Dan Tremble, left, and Republican John Hiatt faced each other in the 2018 race for Penobscot County treasurer. 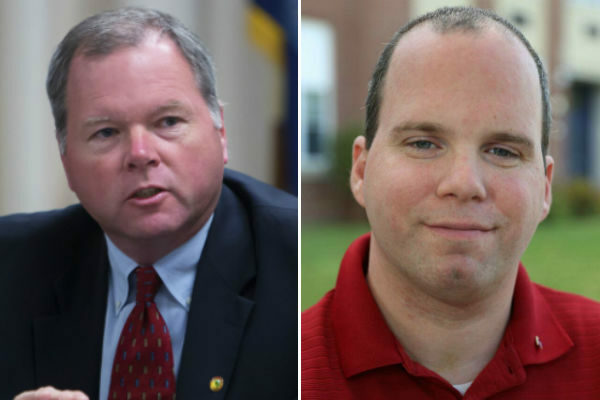 The race for county treasurer is typically an under-the-radar affair. But in Penobscot County following Tuesday’s election, it’s a nail biter. Incumbent Dan Tremble, a Democrat, was hanging onto a lead of just 31 votes as of late Wednesday afternoon out of more than 60,000 cast. With 60 of 64 precincts reporting unofficial results to the BDN, Tremble had 30,508 votes to 30,477 for Republican challenger John Hiatt. Tremble also serves on the Bangor City Council, and Hiatt on Tuesday won a seat on the Bangor School Committee. Also in Penobscot County, a race for county commissioner was still close as of late Wednesday afternoon. With 35 of 38 precincts reporting results in District 3, incumbent Commissioner Laura Sanborn, a Democrat, was leading Republican challenger Jeffery Gifford by 362 votes out of more than 19,000 cast. In neighboring Hancock County, just 203 votes out of more than 27,000 cast separated the two contenders for judge of probate with 40 of 41 precincts reporting. Republican incumbent William Blaisdell held the slight lead over Democratic challenger Lynne Williams. In Waldo County, the race for county treasurer is also tight. Democrat William Sneed held a 169-vote lead over Republican Peter Sheff as of late Wednesday afternoon with 38 of 41 precincts reporting results. More than 17,000 votes were cast in that contest, according to unofficial results.